Latest new articles and information available. In days of old, this was part of your training. In today's world, the line is a bit gray on this subject. Whether to varnish or not to varnish sent in by a reader on our "Frequently asked questions" page. Click here to get the rest of the story and the many answers to this question. You may be surprised at the results. One of the most complicated subjects to paint, a cluster of grapes. 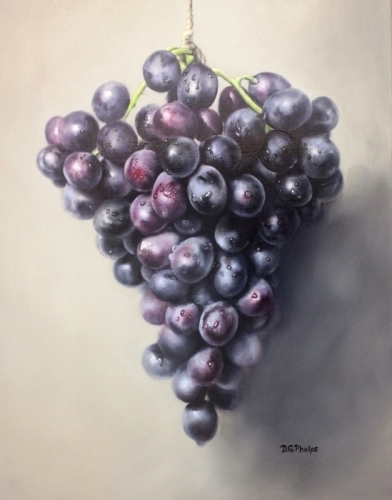 Come see how I handle this subject here How to paint grapes. It includes a great little video at the bottom of the article with some cool music. Feel free to comment and let me know if I missed anything. I feel so blessed when folks take time to write, and include such great works and information or questions. Here's a few examples of just that. Our next contribution was a great question that can befuddle the best of painters. I give a shot at answering it here with How to lay out your palette, cold/warm colors, left to right? Another top question on the "Frequently asked questions" portion of the site invariably centers around color, color mixing. 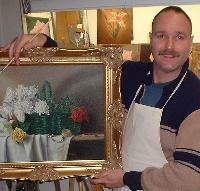 Richard Robinson has such a strong course on the subject, but he also has some great still life workshops available. Please, check these out when you get time.